Tomorrow the husband and daughter will be heading to St. Louis without me to visit Grandma C a bit and clear out of here for a couple days. This is to allow me to dive in to two uninterrupted days of tearing up and re-organizing this house, starting with my office. We'll see how it goes. I'm excited for the chance to dive in for a big ole' block of time. I enjoy this kind of thing, but I get so darn frustrated that I only get to do little bits and it always ends up worse when I'm done. So I appreciate the chance to give it a try. Maybe I'll take before and after pics. Let's just say, I am about 19 months behind in filing, and I'm usually super detailed about filing. Tonight I was packing the bag for them, and I'm trying to make it very clear what my intentions are for Braska's stuff without packing notes with each item. But when it comes to dressing for church, there's no taking chances. 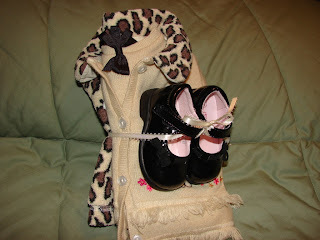 So I made a little bundle of things, including her onesie, tights, shoes, hair bow, and the three-piece outfit. Here's hoping for a productive couple of days, and that Braska will behave for her Pop. She's awfully darn attached to me. This will be the longest she's been away from Mommy. I think I'm due for a break, even if it is a work-36-hours-straight break! That's just smart mom - there are very few dads that could handle the realities of dressing a little one without a little prompting - good luck getting your to do list done, and yes a break will be good for everyone involved. Hahaha - subtle! How great! I think that is clever and helpful. Enjoy your solitary work time! I love having those times too. Funny how when you become a mom, your time away becomes a double for organization. And even funnier how that is what we choose. Good luck, and see you for the game! I was just telling Alex I needed a break. You know why? So I could PACK for our move!!! One of these days we ought to have a break where we sleep and spa! I know what you mean -- it's easier to work when no one else is there. I'm sure you'll get lots done. Go for it!! My organization marathon is over...and at least I got one room done. *sigh* Details will follow...stay tuned!! Thanks for the great cheering section!!! I do hope you got at least a little bit of 'me-time' doing just nothing?? After 19 months and ALL you've gone through I think you deserve at least a day to yourself! Tying up outfits... yep you are the mom of a little girl! Adorable!